Elchim 8thSense. The hairdryer. For everybody. 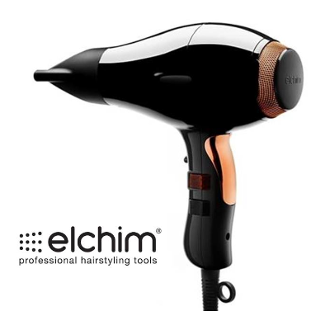 The most advanced professional dryer. 8 types of hair exist and every type needs a specific air flow and temperature. 8thSense is the very first dryer that fits all eight existing types of hair, from thick hair to thin hair, to very delicate baby fine hair, to fragile and damaged hair. With the touch of a finger on the electronic accelerator the 8thSense dryer can regulate temperature and air flow with infinite combinations. 8thSense is quiet, powerful and sensitive. Any professional hairstylist will know at once that a powerful dryer like this has never existed until now. Designed and Made in Italy. Long life AC Professional Motor. Color: Gloss Black/ Copper Sunset. LIMITED TIME, PURCHASE INCLUDES FREE GIFT OF DURASILK APRON AND DURASILK BEFORE AND AFTER CAPE ($55.00 VALUE). NO COUPONS, DISCOUNTS OR GIFT CERTIFICATES APPLY. Powerful Professional 1800-2100w Infinate combinations of air flow and temperature. Ionic Technology: Dries the hair in half the time while adding shine and elimination the “Frizzies”. Instant cold shot button for setting styles. Free Gift w/ Purchase: Limited time offer, Free DuraSilk(TM) Apron, Free "Before and After" Reversible DS Cape. Show off your Salon abilities on social media with our exclusive "Before and After" Reversible Cape. This is a $55.00 added retail value.